GoLift Retrievable Gas Lift Straddle > PTC - Well head, Gaslift, and Chemical injection for improved well performance and integrity. Dwindling production and/or sub-optimal completion design may require introduction of artificial lift or different gas unloading/injection depths at some point in well’s life cycle. Although a full workover could potentially solve the issue, the relatively high costs of such an operation may render the project to be unviable. 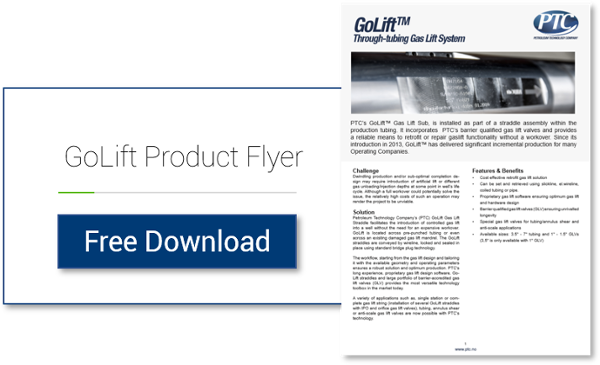 Petroleum Technology Company’s (PTC) GoLift Gas Lift Straddle facilitates the introduction of controlled gas lift into a well without the need for an expensive workover.